Can you believe that Easter is less than a week away? Keeping with last year's tradition, I am making matchy matchy Mommy and Me Easter outfits. This year I wanted to step outside of my comfort zone, and go with something bright and bold. I found the perfect, happiest fabric I have ever seen and it was such a pleasure to work with. Here is what I came up with. 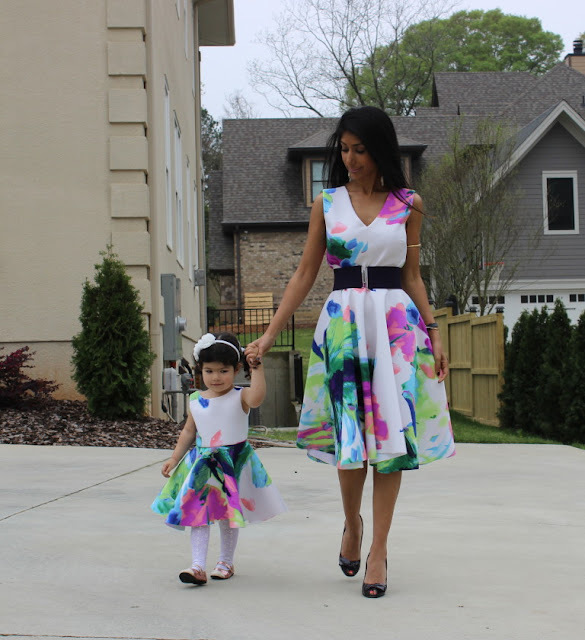 This dress is a mix between a pattern and self drafting. I used McCall 7315 for the bodice, view D. For the skirt and facing of the bodice, I self drafted the design. The facing is lined with the same fabric I used for the outside of the dress. I used a gorgeous floral abstract scuba knit from Fabric Mart. (Sold out now) I have never sewn with or even touched scuba knit before and I have to tell you that it was such a joy to work with. It's fun to cut, fun to sew and it presses beautifully. That surprised me given its made with a man made fibre. I also LOVED the fact that it does not fray. What you say? A raw hem on a high end looking garment? Yes please!!!! The backside of garments are often overlooked. I showed the back some love by opting for a v-neck and also installing a beautiful exposed zipper with gold teeth. Oh! And watch me twirl in this full circle skirt. I love the body and drape of this fabric. It makes wearing a circle skirt so much fun! And here is my daughter's dress...so adorable! I hope you enjoyed reading this! Sewing with scuba knit is such a pleasure.. Give it a try! See you in April. Until then, Happy Sewing! This is truly gorgeous! I would have guessed cotton sateen. I love scuba knit too . It sews into higher end looking garments , IMO. It looks like a lot of fun to wear. Beautiful, Vatsla! Stunning fabric! I like the zipper-very creative!! This is beautiful! Wish I had picked up that fabric! I just picked up a scuba knit at my local Joann's to make a dress for my daughter and I'm glad you love the fabric so much, it makes me even more excited to sew it up! Thank you! Love to see what you made for your daughter and self! Your dress is lovely - really says "Spring has arrived!" I love the back zipper detail. Y'all really NEEEEEEED to bring back this floral scuba knit!! Total and complete HEART EYES! Love how this turned out, Vatsla. Thank you Abbey! I agree, would love more of this fabric! Beautiful! 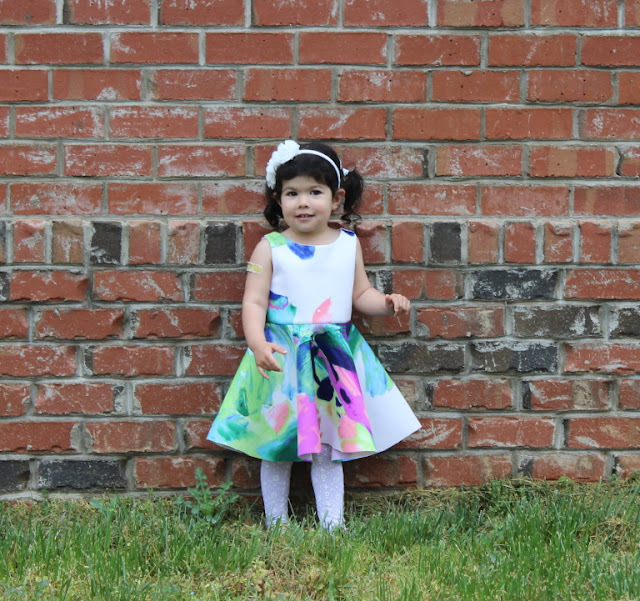 You chose a wonderful style for this print, and the black belt and shoes set it off perfectly. Great job!